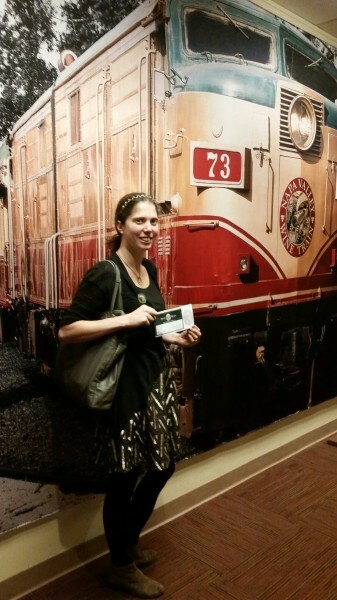 Disclosure: I was invited to partake in the Napa Valley Wine Train. This is my story and all opinions are my own. Who knew that it would happen shortly a year later. 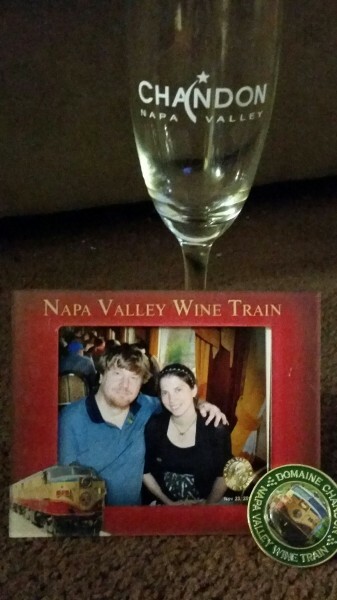 The Napa Valley Wine Train would make a great gift for a loved one especially during a birthday, anniversary, or special occasion celebration. It’d also make a great date with your loved one. This is exactly what my significant other and I did. I even made sure to dress up for the occasion, and on the day of our excursion we made sure to take in everything that we could and make it a memorable date day. 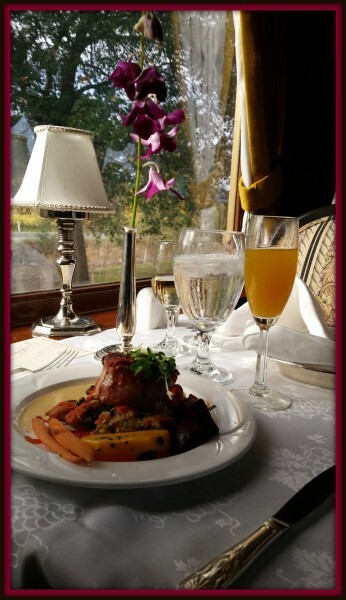 The Napa Valley Wine Train has a variety of packages available to choose from: Please note that the Packages include the 3 Course Gourmet Lunch, a Complimentary Wine Tasting, but all other drink orders made on board are an additional fee. These expertly refurbished 1915-1917 Pullman Cars create an atmosphere conducive to relaxation and enjoyment. Meals, crafted by Executive Chef Kelly Macdonald, are prepared in a specially fabricated kitchen car located immediately adjacent to each dining area. As with all our menu choices, the meals are freshly prepared on the train using environmentally responsible ingredients, humanely raised, hormone free meats and fresh, line-caught fish. One welcome taste of wine included. And you can even pair your Wine Train Lunch with a Winery Tour: That include a multiple course meal on the wine train along with a full tour and tasting at the winery you choose: We paired our lunch with a Chandon Winery Tour. They also have dinner trains available. Check in begins at 10:30am. 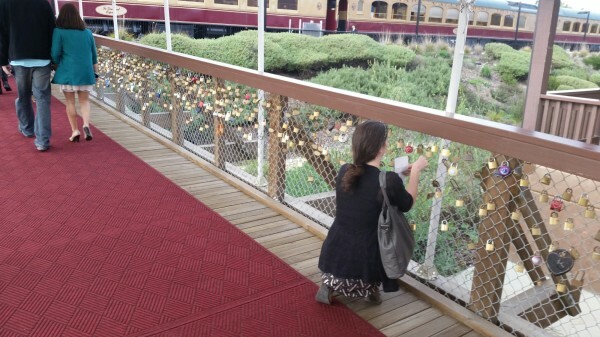 As you wait to board the train you can look through the gift shops, purchase a glass of wine inside or purchase a love lock to place upon boarding the train. 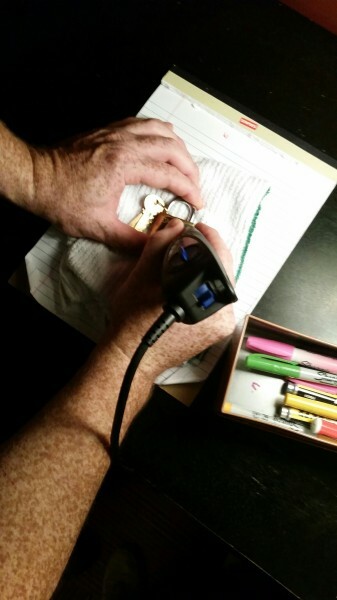 In the shop they also have an engraving machine so you can engrave your names on your purchased lock right then and there. We did exactly that. Upon boarding everyone walks through the love lock bridge and then a photographer greats each couple or group for their picture in front of the train. Another picture is captured on board with the opportunity to purchase these photos at the end of your train ride back at the station. As we were boarding I placed our love lock onto the fence to lock our love into eternity! Then we are directed to our dining car. Some people may dine first, or those in the late dining car may begin in the lounge car with appetizers. 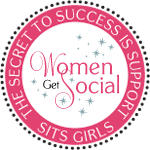 If you are a couple of two be aware that if you choose the Chandon Winery Tour or a special event package guests may be seated with others depending on how busy the train is that day. If you are on one of our Dining Journeys (Vista Dome, Gourmet Express, Silverado) you will have a private table regardless of how busy the Train is that day. 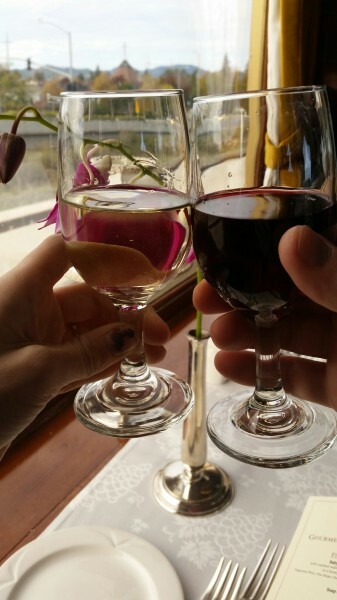 They then begin pouring our welcome glass of wine, two selections made exclusively for the Wine Train: A Chardonnay and a Merlot. Then dining service begins. And the food is pretty incredible. 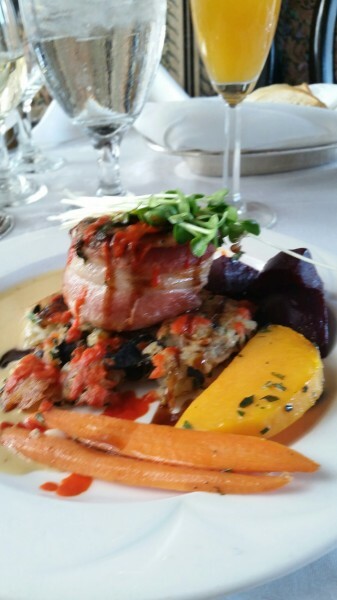 Options of Pork Medallions, Vegetarian Risotto, and more are available. A choice of soup or salad pre meal is also offered. 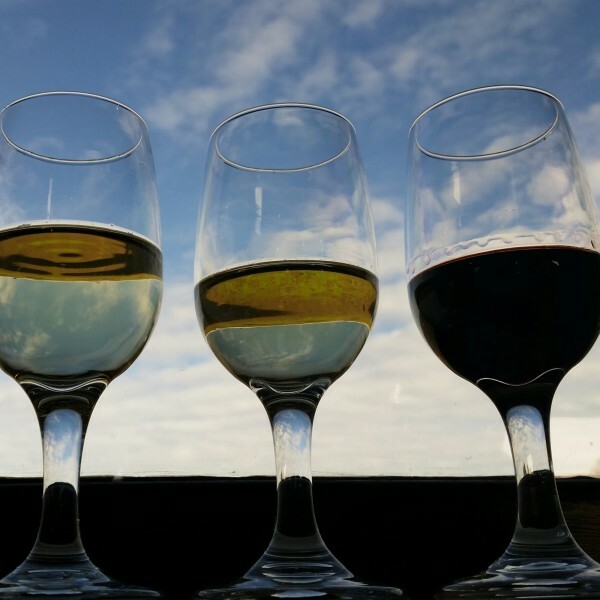 After dining with our winery tour package, guests are then moved to another car for dessert where you can order a glass of wine, a flight of wine, and enjoy the views around you within beautiful Napa Valley. On our journey we had a ton of fun capturing the Wine Flight with the gorgeous day we had. And, if on the Chandon Winery Tour, a stop at Grgich Hills Estate is where our wine train experience ends, and our winery experience begins. 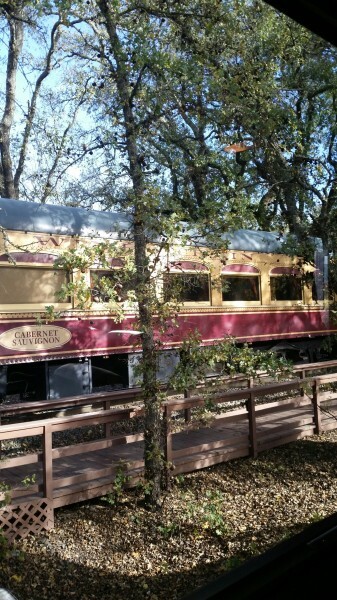 The Napa Valley Wine Train has teamed up with Wine Country Tours to help shuttle guests to the various wineries they’ll be touring the day of their excursion. 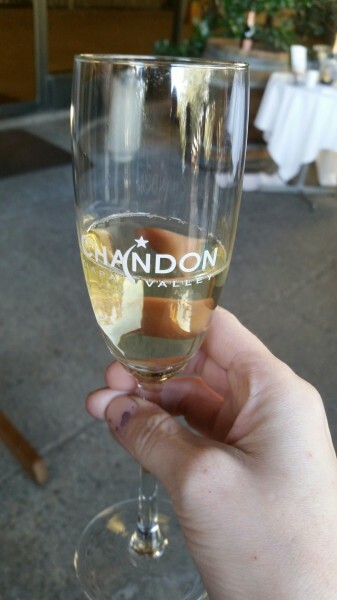 So, as we got off our train, we boarded right onto our shuttle then headed to Domaine Chandon. 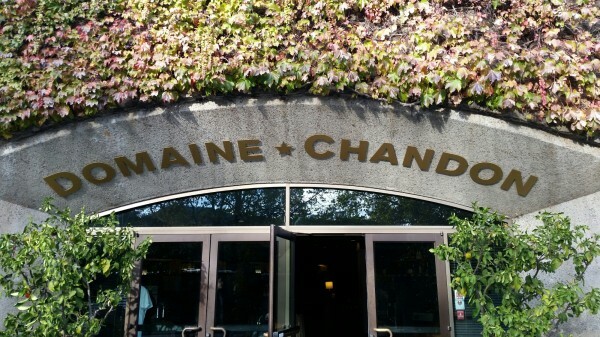 Once at Domaine Chandon we were taken on a behind the scenes tour of the property with various tastings of Sparkling Wine along the way with ample time to shop and enjoy more wine afterwards, if needed. And then we are shuttled back to the Train Station where we can buy souvenirs, hop in our cars to head home, or tour a bit of Downtown Napa afterwards. 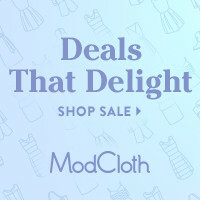 Truly, this is a great one of a kind Experience Gift for a loved one. One they’ll be talking about for years down the road, and one I’d highly recommend. Oh this looks like so much fun! 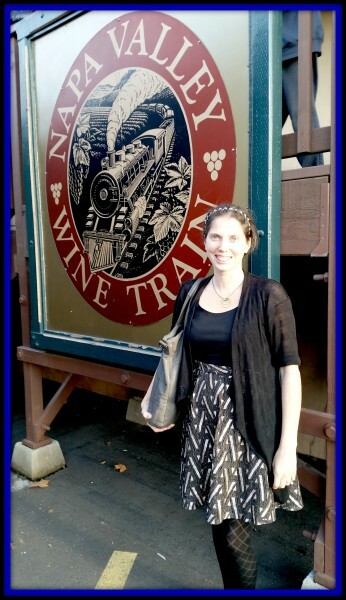 I have heard of the wine train and it is on my list too! The food looks amazing and how fun to sip and eat while viewing the beautiful sceanery. 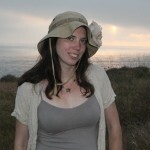 I also like the love locks – So cute. Thanks for taking me along on your trip! Cheers!